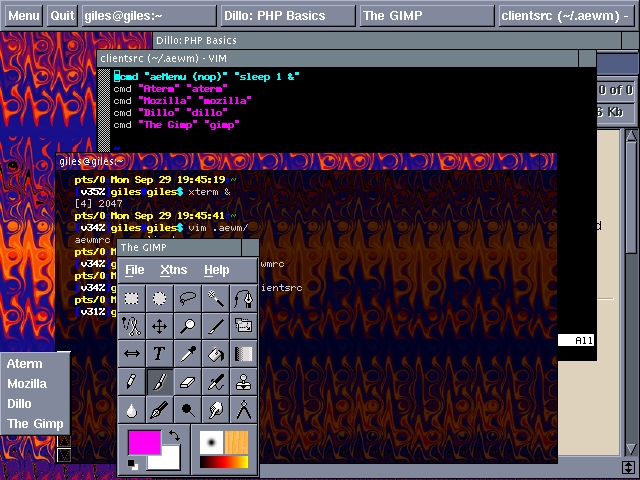 An aewm screenshot, showing the accessory "aepanel" along the top, the accessory "aemenu" at middle left, and the fascinating effect of aterm's transparency which extends even to the title bar. I used 1.2.0 because I was unable to compile the latest (1.2.3, issued March 2003 - still the most recent at the end of September 2003). It requires Glib-2.0 and I wasn't willing to get tangled up in compiling that. I wasn't impressed. Getting started is difficult, as the documentation never tells you what the default RC file name is, and no default RC is supplied for the accessories (although there are examples in the man pages). No. Colours are somewhat configurable from the command line. This is one of the most popular window manager code bases to use to create new window managers. The author, Decklin Foster, has put a lot of time into creating a clean and simple and mostly ICCCM compliant WM, and apparently he's succeeded. His philosophy is to separate the window manager function from anything that should be an accessory, so aewm doesn't have a taskbar or menus. He has also created a taskbar utility called "aepanel" and a menu utility called "aemenu" which ship with the WM. I found it difficult to start with aewm (mediocre documentation without example RC files) and not much to my liking. No workspaces, no key bindings apparent, no way to make key bindings, no maximizing of windows, and the accessories don't work too well. The default behaviour is SloppyFocus. Left-click on the titlebar raises the window, but won't move it. Middle-click is used for move. Right-click lowers the window. aewm may have brought us the multi-function titlebar button: the titlebar has only one button, but its function varies depending on the button you click on it. A left-click minimizes, middle-click resizes, and right-click kills. The most amusing quirk I found was that aterm's title bars become completely transparent (as you can see in the image above). I use aterm with partial transparency, and that apparently affects the titlebar as well. Since the titlebar text is white by default, it's usually readable against my dark backgrounds. I didn't see this occuring with any other windows (although aterm does this in some other window managers). A less pleasant quirk showed itself with aemenu, which frequently left menus lying around the desktop if I didn't select from the menu. I found I could open dozens of menus at once, which isn't very useful. Keep in mind that I wasn't working with the most recent version. Another thing I didn't appreciate (although it could be called a feature, not a bug) is that the taskbar (aepanel) raises but doesn't focus the window when you click on the icon. Since you're generally clicking on the icon to use the window, why would you not want it focused? aewm is under one megabyte in memory when in use, but the accessories (aepanel and aemenu) both weigh in at around 2M in memory - aemenu is run only on an as-needed basis, but aepanel is in memory all the time if you use it. aewm would be almost unusable without the menu, but you could get by without the panel. A good code base if you want to write a WM. Not as lightweight as I expected after you add aepanel. Could be run without. No maximize. None evident from the website.